In conjunction with World Youth Day, which will be celebrated in Madrid between 16 and 21 August, the Museo Thyssen-Bornemisza has organised an exhibition comprising a selection of outstanding works from its Permanent Collection of Old Master Paintings. Dating from the 14th to the 18th centuries, they illustrate various episodes from the life of Christ during three different stages of his life. The exhibition will be displayed in the Contexts Exhibition Room at the first floor and the admission will be free. 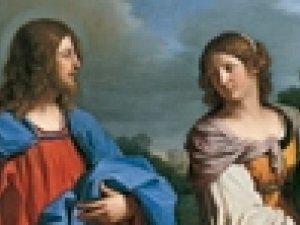 Among the works on display will be the panel of Christ and the Woman of Samaria by the great 14th-century Sienese master Duccio di Buoninsegna, juxtaposed with another depiction of the same subject by Guercino, one of the leading painters of the 17th century, whose interpretation is characterised by its pronounced naturalism and serenity. Among further examples of Italian painting is a notable pair of canvases by Giovanni Paolo Panini depicting The Expulsion of the Money Changers from the Temple and The Pool at Bethesda, painted in Rome around 1724. Panini used monumental architectural settings to organise the numerous groups of figures in his compositions. The Northern schools of painting are well represented in the exhibition. Among the examples on display is Dürer’s panel of Jesus among the Doctors, considered one of the great masterpieces in the Collection due to its technique and the originality of its composition. Jan Brueghel I’s painting on copper panel depicts the miracle of Christ in the Storm on the Sea of Galilee, set in a markedly realistic landscape and characterised by its lively chromatic range. Two interior scenes depict other incidents from the life of Christ, namely The Calling of Saint Matthew by Marinus van Reymerswaele and The Supper at Emmaus by Matthias Stom, whose chiaroscuro technique recalls the style of Caravaggio.